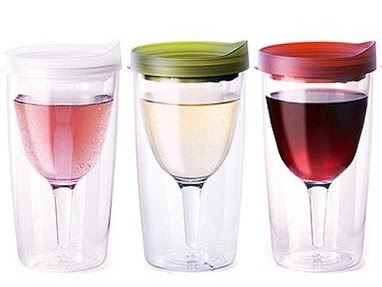 Wine sippy cups make total sense! Why they put wine in a cup that's elevated on a stem just begging to fall over is beyond me. Sure it's nice to look at the legs of the wine, sip, swirl, etc. but at the end of a long day, an I.V. hooked up to the spigot on a box is perhaps more what we're after. Oh dear , I hope it wasn't the last dregs of the bottle ! Oh man...I want wine sippy cups. Rather perfect for drinking while gardening. This certainly gives a new spin to my friends' kids asking for "Mommy's juice". Utter exhaustion was probably the key factor in your mishap but wine sippy cups make perfect sense to me! The other night I wanted a glass of wine but I was too tired to actually lift my arm and swallow liquids so I asked Greg if he would drink it for me. That jerk wouldn't do it! An IV from a box sounds PERFECT. It wasn't the very last but it was close! It's true. I am always clumsy but everything gets way worse when I'm very tired. Aaargh, what a disaster. Exhaustion and red wine together are lethal on several levels. Glad to hear the duvet and sheets washed up ok but you may be traumatized every time you lift a glass of red from now on. I need one of those! I'm a klutz. Those are kind of amazing. What pain, to do some sorting as you were about to relax. Glad the bleach worked though! These sippy cups are brilliant. I can't count the number of times I've overturned a glass of wine. It's like, the more you NEED the glass of wine, the more likely you are to knock it over before getting to drink any. This clumsy girl has switched to a tumbler (it's more European, or so I claim) but a wine sippy cup sounds like the new craze. When can I find them on Etsy? I use stemless glasses, partially because they should be harder to knock over . . . except they're not. My mom got me a wine sippy cup off of Amazon!